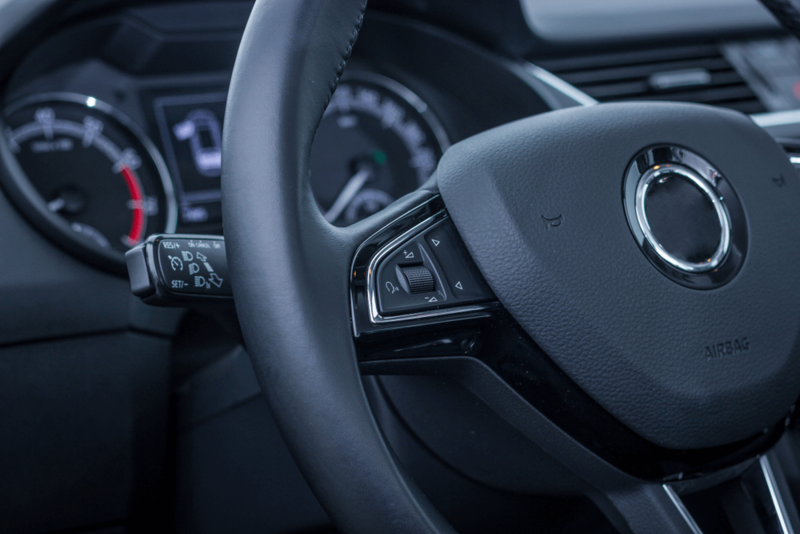 Next to the foot pedals, the steering wheel is probably one of the dirtiest parts of your car’s interior. This critical component is home to an array of dirt, germs, bacteria, and body oils that are enough to scare the clean-freak amongst us. If you are planning to do some interior cleaning and detailing on a quiet Saturday or Sunday morning, then I highly suggest that you spend a modicum of time cleaning the steering wheel. I’m not just talking about wiping it with a damp cloth. This will remove dirt, yes. But simply wiping it will not get rid of germs and bacteria. 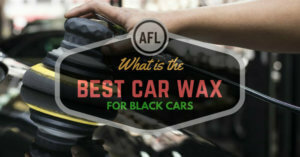 It is also not enough to remove deep-seated dirt on the stitching of your elegant leather-trimmed wheel. 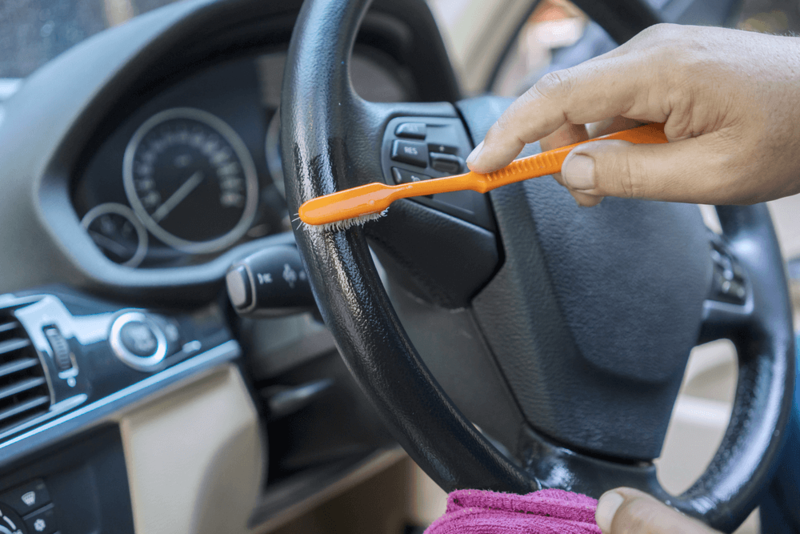 Let me ask you a simple question: when was the last time you cleaned the steering wheel in your vehicle? 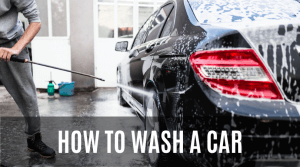 There is nothing wrong with cleaning the steering wheel with a wet towel, but what about on old and used cars? If you recently bought a used car, I highly suggest you clean the steering wheel immediately before planning to take a long drive over the weekend. Why? Simple. Our hands are constantly exposed to dust, dirt, and bacteria. We cough or sneeze while we drive. We eat while behind the wheel; yes, I’m talking about the occasional drive-thru of cheeseburgers, fries, and soda. In short, our hands are constantly touching the wheel and this is more than enough to transfer all that dirt and oil to the tiller. If you can help it, avoid eating inside the car. 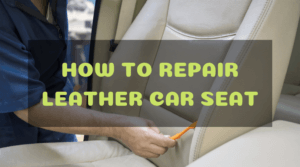 It is a good idea to always have some wet towels and rubbing alcohol in the glove compartment so you can clean your grubby mitts after eating that delicious roast beef sandwich while sitting in your car. 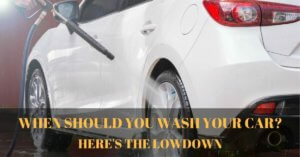 You should take the time to clean the interior every time you wash your vehicle. Make it a habit so you don’t forget cleaning one of the most neglected parts of the interior in your vehicle – the steering wheel. Leather steering wheels are a bit tricky to clean. Harsh cleaners will rapidly deteriorate the color and feel of your leather tiller. 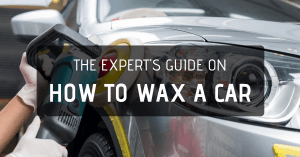 This article will show you how to clean both vinyl and leather-wrapped wheels. Please cover your mouth and your nose if the urge to sneeze or cough arises while you’re behind the wheel. Your steering wheel (and the entire center console) will thank you for that. You should tackle tough dirt and stains immediately in order to prevent permanent damage. I’m talking about sludge and thick grime. If you accidentally touched the wheel while your hands are dirty from working under the hood, then you should remove the dirt from the tiller immediately. Here are the simple steps on how to clean and detail the steering wheel. 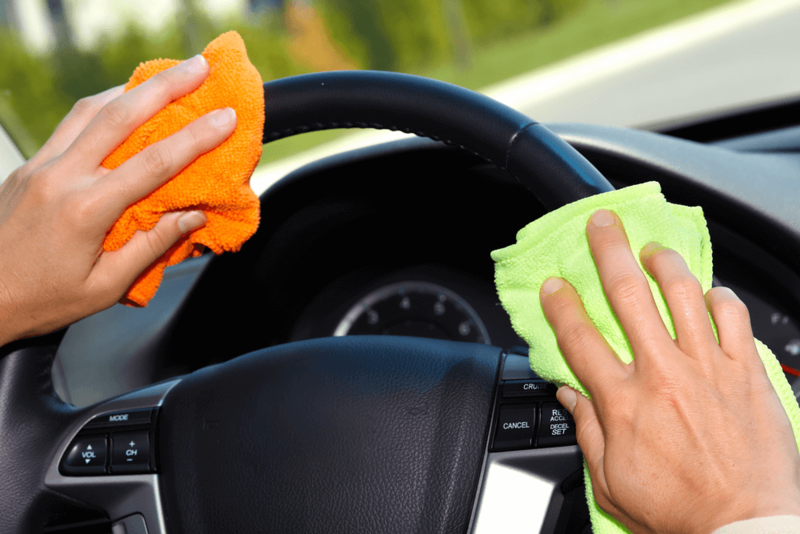 If the steering wheel is extremely dirty, it would be best to wipe it first with a damp towel to remove excess dirt. 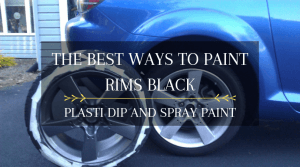 This will also make it easier for the cleaner to penetrate the surface of the wheel. Simply grab a clean microfiber towel, dip it in water, and wipe the towel around the steering wheel. Put the towel between your hands and grip the wheel so you can do a 360-degree clean with minimal effort. After cleaning the tiller with a damp cloth, your job is not done. It is time to whip out your trusted all-purpose cleaner. I prefer using the Armor All Multi-Purpose Cleaner for vinyl steering wheels. This product is an all-in-one interior cleaning solution that is strong yet gentle enough to be used on the dashboard, carpet, and clear plastic in the console. It also has a pleasurable and invigorating scent. For cars equipped with a leather-wrapped steering wheel, I like using the Shine Society Lemon-Aid All Purpose Cleaner. 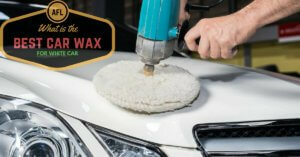 This product is also great for cleaning leather seats and interior trim without drying out the surface. The best part is this product will also disinfect while removing dirt and grime. This product is formulated using all natural ingredients and is safe to use around children or pets. Spray a moderate amount of the cleaner on a dry microfiber towel until damp. Wipe the entire surface of the steering wheel. There is no need to exert too much effort or rub the wheel incessantly. Let the cleaner do the work. Avoid spraying the cleaner directly on the tiller to avoid overspray on the gauge cluster. Do not let the cleaner soak on the wheel. Wipe the tiller immediately with a dry towel after using an all-purpose cleaner. In order to clean the stitching on leather steering wheels, simply spray a small amount of the cleaner on a small interior brush or toothbrush. Lightly brush the stitches until the color of the stitching is restored. 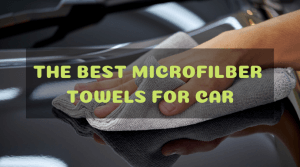 Wipe off the excess cleaner with a dry microfiber towel. Repeat as desired. Give the steering wheel a final wipe of a dry towel and you’re done! I would recommend using leather conditioner on leather-wrapped wheels but there is a tendency for the tiller to be slippery after applying conditioner. 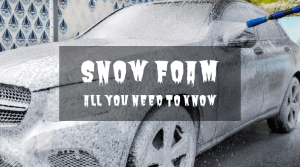 If you prefer using leather conditioner, use only a small amount of the product and wipe off the excess immediately before driving your vehicle. 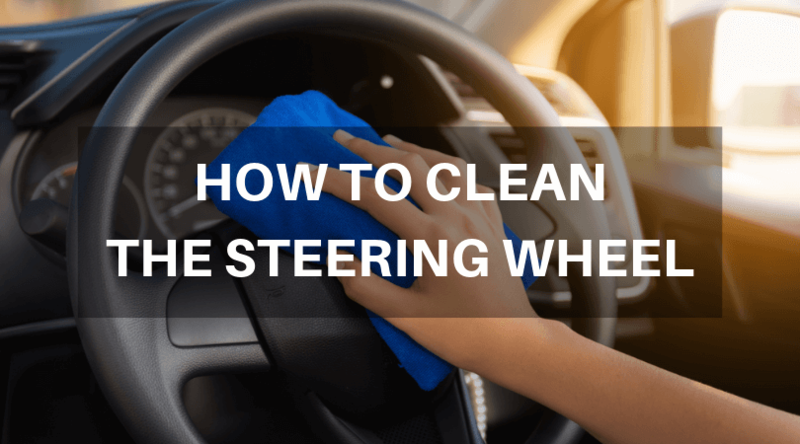 It doesn’t take a lot of time and elbow grease to clean the steering wheel in your car. Remember that an ounce of prevention is worth a pound of cure. If you start with clean hands before you drive, then you can avoid inflicting the steering wheel with dirt and germs while you drive.